Don't miss this amazing safari to Maasai Mara Game Reserve and Amboseli National Park in Kenya, where you will witness the African wildlife and nature as you go on daily game drives with your professional and knowledgeable guide. Both national parks are famous for their beauty of African flora and fauna that will definitely take your breath away. Discover the beauty of Kenya! During this safari, you will be staying at various accommodations such as Lenchada Tourist Camp, Lanet Matfam Resort, a hotel in Nairobi on day four for a night, and Ol Tukai Lodge. Lenchada Tourist Camp is a budget safari camp just outside the gates of the Maasai Mara National Reserve, regarded as one of the wildlife jewels in Kenya. The camp is built with all the comforts of home, including solar-heated showers, bed with pillows, sheets, blankets, and mosquito nets. Additionally, as a backup, a standby generator that supplies lights and refrigeration for the dining area allows cell phones and digital cameras to be recharged. The camp is surrounded by a natural environment; experience waking up to bird twittering and roaring of lions and hyena and monkey’s drama in the bush around. The camp charms guests with its warm welcome and rests along a stream valley overlooking picturesque hills and rolling plains of Oloolaimutia in Maasai Mara National Reserve. Lanet Matfam Resort is situated in Nakuru East, approximately 10 kilometers from Nakuru city center. The resort prides itself on offering guests comfort and quality accommodation, be it for a short or long term stays. The resort is ideal for business travelers and those individuals looking for a tranquil retreat. There are 14 rooms of which, nine are double rooms and five are single rooms. These rooms are designed for comfort and offer en-suite bathrooms and DStv. There are a lounge and dining area and the well-manicured garden feature a children’s play area as well as a lapa. Nakuru offers many attractions such as the Lake Nakuru National Park, Lake Naivasha, Hell's Gate National Park, and Menengai Crater, a must visit place for any visitor to the area. Ol Tukai Lodge is one of the best spots in the world to watch elephant with the backdrop of Africa’s highest mountain, Mount Kilimanjaro. Writers have described Ol Tukai and the surrounding Amboseli National Park as "a home for the Gods". Ol Tukai is an eco-rated lodge having excellent outdoor and indoor facilities with its unique collection of African art. The property receives an overwhelming response from the international and local tourism market. You will be picked up from your Nairobi hotel at 8:00 a.m. and commence the drive to Maasai Mara via the Great Rift Valley view point where you will have a breathtaking view of the floor of the rift valley. Lunch will be a picnic on the way. In the afternoon after you check in, depart for a game viewing drive in the Maasai Mara National Reserve. Return back to the camp for a sumptuous buffet dinner ending with a good time for resting at Lenchada Tourist Camp. Maasai Mara National Reserve is the most popular tourist destination in Kenya that is located in the Great Rift Valley in primarily open grassland. Wildlife is most concentrated on the reserve’s western escarpment. It’s regarded as the jewel of Kenya’s wildlife viewing areas. The annual wildebeest’s migration alone involves over one and a half million animals arriving in July and departing in November. Hardly can a visitor miss to spot the big five. The phenomenal wildebeest migration which is a spectacular event only seen in Maasai Mara is the wonder of the world. You will spend the full day exploring Maasai Mara in search of the big five. You will have picnic lunches in the reserve as you scale the Mara beauty sat on the banks of Mara River. In the evening, you will have optional activities you can enjoy such as visiting the local Maasai village for a Masai cultural tour and learn about the Masai community and interact with the local Masai people. An overnight at the Masai village can be organized upon request. You can also enjoy an optional balloon safari that can be organized early morning on this day then proceed with the normal program. It is in the Mara that perhaps the most spectacular event of the natural world takes place, the great migration. This is the annual migration of millions of wildebeest and zebra from the Serengeti, in Tanzania in search of water and pasture. Following on their heels are the predators of the savanna, lions, cheetahs, jackals, hyenas, and vultures. You will enjoy the last early morning game drive in Maasai Mara National Reserve followed by breakfast. Thereafter, commence the drive to Nakuru. You will overnight at Lanet Matfam. You will have an early breakfast and depart by 7:00 a.m. straight to the park. It’s a small park with magnificent, rare white rhinos which form part of the big five animals. There is also a possibility to see the pink flamingos. The game drive lasts three hours, after which you depart on a three-hour drive back to Nairobi to arrive at around 3:00 p.m. You will be dropped at your hotel in Nairobi. You will be picked up from your Nairobi hotel in the morning drive to Amboseli National Park which is famous for its scenery with a backdrop of snow-capped Mount Kilimanjaro, which dominates the landscape and is open plains. Arrive with more game drive proceeding to your lodge for check in, and time for lunch. Check-in at Kibo Safari Lodge to have lunch and a short rest. 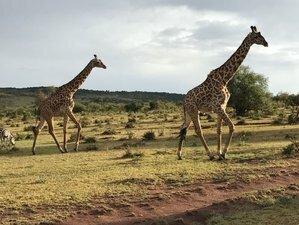 Afternoon game drive in search of its popular residents like the well-known predators and their opponents like the zebra, wildebeest, giraffe, and hippo with a view of Mount Kilimanjaro. Later, you will have dinner and overnight at Ol Tukai Lodge. You’ll have early morning game drive and return back to lodge for breakfast. After breakfast, you will have a full day spent in the park with packed lunch in search of its popular residents like the well-known predators and their opponents like the zebra, wildebeest, giraffe, and hippo with a view of Mount Kilimanjaro. Later, return to your lodge for dinner and overnight stay. You will have an early morning game drive, later, return to your lodge for breakfast. After breakfast, check out with a short game drive en-route off Amboseli and drive to Nairobi. When you arrive, you will be dropped to your hotel or to Jomo Kenyatta International Airport (NBO). This marks the end of the tour. This safari will take place in Kenya covering Maasai Mara National Reserve, Amboseli National Park, and Nakuru. Kenya is a country full of surprises and many are amazed to know that besides safaris and wildlife, the country also has some of the best beaches in East Africa. The beauty of this land is that, besides the assortment of activities and sights it has to offer, it is also easy to enjoy a safari and a beach holiday combination. Kenya’s coastline boasts brilliant blue water, lined with protective coral reefs, creating ideal conditions for swimming, snorkeling, sailing, and water sports. The palm-lined beaches are the ideal relaxing environment for the end of your safari holiday. Evenings can be spent reminiscing about your adventures through the Maasai Mara or marveling over the enormous red elephants you saw in Tsavo East National Park. Reflect on the splendor of Amboseli National Park and Mount Kilimanjaro and sort through your countless photographs of rare and glorious birds. Finally, take a stroll on the soft white sand before drifting off to sleep. Located about 250 kilometers from Nairobi and along the Tanzanian border, the park derives its name from the Maasai word ‘empusel’ that means salty, dusty place. Declared a national park in 1974 to protect its unique and fragile ecosystem, the Amboseli National Park offers landscapes of remarkable contrasts, such as arid zones alongside lush oases of the swamps. The ecosystem of this low rainfall region depends on the water from Mount Kilimanjaro. A particular feature of the Amboseli National Park is the possibility to take postcard photos of elephants against the backdrop of Kilimanjaro. Covering an area of 392 square kilometers, the park is, in addition to elephants, home to numerous animals such as giraffes, wildebeests, antelopes, buffalos, lions, cheetahs, leopards, and hyenas, as well as over 400 species of birds such as pelicans, kingfishers, cranes, hamerkop, and 47 types of raptors that live alongside the Maasai villages. This compact park is abundant with wildlife and allows for excellent game viewing. Its vegetation consists of a combination of sprawling grasslands, swampy springs, and dry dusty earth. From observation hill, you will have a view of the entire park and especially the swamp areas where buffalos, elephants, hippos, and a diversity of water birds come to cool off and refresh themselves. Look out for the shy porcupine who only dares to emerge at sunset. Covering an area of 1510 square kilometers, the Maasai Mara National Reserve is, in fact, the extension in Kenyan territory of the vast Serengeti Park in Tanzania. Together, they constitute a huge ecosystem in which animals move freely. All large African animals are present, such as Thomson’s and Grant’s gazelles, the impala, Kirk’s dik-dik, the bushbuck, the topi, the buffalo, the ellipse waterbuck, the elands, and giraffes. Famous for its rich wildlife, the Maasai Mara National Reserve is home to not only the big five (elephant, lion, buffalo, rhino, and leopard) but also to many birds, over 500 species of birds have been recorded here. Along the rivers, crocodiles and hippos lie in wait. Composed of vast rolling plains and hills, the Maasai Mara National Reserve is dotted with umbrella thorn acacias and thorny thickets. In the Maa language, ‘Mara’ means spotted and may refer to the colorful landscapes. Lake Nakuru is one of the Rift Valley soda lakes at an elevation of 1754 meters above sea level. It lies to the south of Nakuru, in the rift valley of Kenya and is protected by Lake Nakuru National Park. The lake's abundance of algae used to attract a vast quantity of flamingos that famously lined the shore. Other birds also flourish in the area, as do warthogs, baboons, and other large mammals. Eastern black rhinos and southern white rhinos have also been introduced. The lake's level dropped dramatically in the early 1990s but has since largely recovered. In 2013, the lake received an alarming increase in the water levels that led to the migration of flamingos to Lake Bogoria in search for food supply. Nakuru means dust or dusty place in the Maasai language. Lake Nakuru National Park, close to Nakuru town, was established in 1961. It started off small, only encompassing the famous lake and the surrounding mountainous vicinity, but has since been extended to include a large part of the savannahs. Lake Nakuru is protected under the Ramsar Convention on wetlands. During this safari, you will be provided with three daily meals including breakfast, lunch, and dinner. Bottled water is also available. In the evening on day two, you will have optional activities you can enjoy such as visiting the local Maasai village for a Masai cultural tour at 10 USD. You can learn about the Masai community and interact with the local Maasai people. An overnight at the Maasai village can be organized upon request. At Lake Naivasha, you can enjoy a boat ride for an hour for hippo viewing and bird watching. You can also experience a balloon safari at 400 USD per person that can be organized in the early morning on day two, then proceed with the normal program. Please book your flight to arrive at Jomo Kenyatta International Airport (NBO). Transfer from and to the airport is included. Perfect Wilderness Tours and Safaris will pick you up from the airport or from your hotel in Nairobi. There will be a special discount for a group. Please enquire for more information.